Bonding can be utilized to change the size or shape of your teeth, and to create a smile that appears more symmetrical and space-free. This single-visit procedure provides a fast solution for a more attractive smile and may eliminate the need for orthodontic treatment in some cases. Tooth stains and discolorations that resist professional tooth-whitening procedures may also be masked by bonding. Although bonding may not be as long-lasting as porcelain veneers or crowns, it can last for a number of years with proper care. The preservation of more natural tooth structure. Minimal risk of allergic reaction. Bonding the front teeth typically requires one appointment. 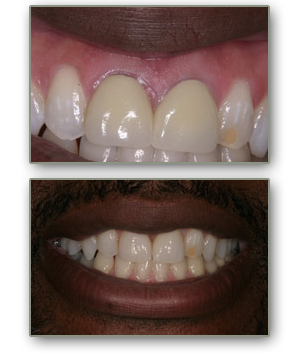 Dr. Simone may remove a very minor amount of tooth structure to maximize adhesion of the composite resin to the tooth. A tooth-conditioning agent may be applied to the prepared chipped, stained or worn teeth, which are repaired by the application of a composite resin-bonding material directly onto each tooth's surface. This less expensive procedure allows the dentist to restore or enhance your smile in a single visit.